You may have noticed that I haven't been posting anything here for quite a while now. That is because I have moved my blog over so that it's integrated into my official website at www.CliffBarackman.com. I am still blogging as often as I can, so click this ink to go over to where I post my stuff to keep up with my work. I will keep this site as a storehouse of my past work. Finding Bigfoot's second expedition to Louisiana was centered around the Duhon Photograph. The picture shows a clearly bipedal figure standing next to a hunting blind. The figure is either a sasquatch or a human being dressed head to foot in dark clothing, despite the 90+ degree temperatures. 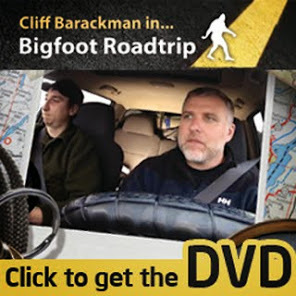 My field notes for the Virginia episode of Finding Bigfoot have now been published. Click here for an analysis on the above photograph, as well as behind the scenes pictures from the filming of the episode.